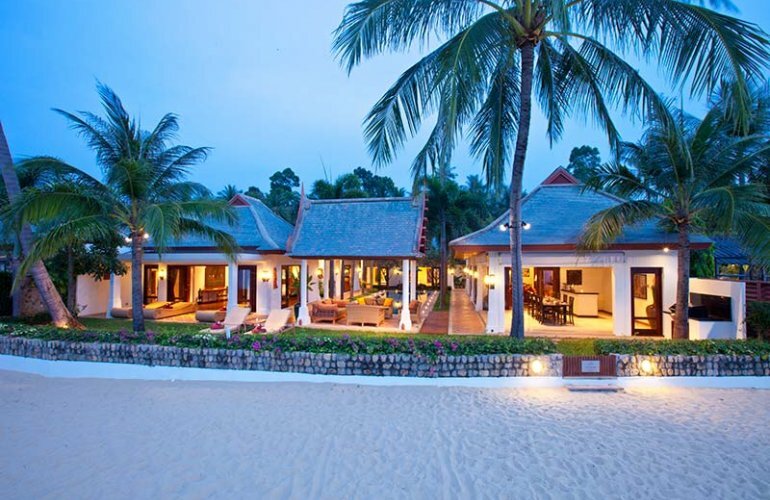 The beautiful blend of contemporary and quality modern design of this beachfront residence on Koh Samui's north coast beckons groups of 10-12 people to its heart for a luxurious and peaceful vacation in quite stunning surroundings. Enjoy fantastic sea views, the private centrepiece salt-water lap pool - and direct access to a wonderful sandy beach. Perfectly positioned for a holiday which brings together the peace and calm within the walls of your own villa, with that of a slightly busier trend outside, this stunning 5 bedroom villa situated in a small and exclusive beach front residential estate on the northern coast of Koh Samui, is 20 minutes from both the island's airport and Chaweng, the main tourist centre with its great choices of restaurants and nightlife, and 15 minutes to the Santiburi golf and country club. The villa boasts marble or teak floors, exposed timber and vaulted ceilings, wood panelled walls to the dining room, marble bathrooms, and an overall decor of natural and neutral colours. This pleasing environment is repeated in all three of the pavilions which comprise the whole villa. The kitchen and all living and bedroom areas are fully air conditioned, and ceiling fans add to the tropical atmosphere in the bedrooms, living room, open air lounge and the sala. There is free broadband Wi-Fi internet access provided at the villa and an iPod dock for playing guests' own music. The music system includes outdoor speakers in the sala. There is a portable gas BBQ should guests prefer this cuisine occasionally. The three pavilions of the residence have at their heart the salt water lap pool. Beyond the pool is a lawned garden with access to the beach, and views to the island of Koh Phangan. At the beach end of the pool is the sala, an open sided pavilion equipped with loungers, a table and chairs. In the garden there is an outdoor bathroom, and close to the beach entrance is a shower. The living pavilion is to the left of the pool and includes the open plan dining and living areas, and a fully fitted western style ultra modern kitchen. The living room is comfortably furnished with sofas and has a large plasma screen home theatre system with satellite TV/DVD and CD player. The dining room has a round teak wood dining table for 10. An additional entertaining area is provided off the lounge where there is a bar, the music system, another large dining table and comfortable seating. There is a guest bathroom off the dining area. The villa's five bedrooms all have teak furniture, walk-in closets, wall artwork and en suites with double wash basins, and both indoor and open air showers. The master and second bedroom suites are in a pavilion to the right of the pool. In addition to the usual features, the beachfront master bedroom suite has its own satellite TV/DVD and a dressing room leading on to the en suite bathroom, which also has a bath tub. This bedroom has its own terrace area with sun loungers. The second master bedroom en suite also has a bath tub. The other three en suite bedrooms are in a pavilion at the rear of the property. Here there are two twin bedrooms, and a third, large, family bedroom, with a double and two single beds. This room also has a seating area. The terrace between this pavilion and the pool is designed for al fresco dining.